A funeral insurer slammed by the banking royal commission for potentially misleading Indigenous customers has rebranded and enlisted a former NRL star as an ambassador. Jamal Idris, who retired from rugby league in 2017, has been promoting Youpla — a rebrand of the Aboriginal Community Benefit Fund (ACBF). At the royal commission, ACBF faced accusations of exploiting the cultural significance of funerals to Aboriginal communities and selling low value products, including to children. ACBF’s chief executive Bryn Jones was questioned at the royal commission in July last year about ACBF’s door-to-door sales tactics, which he pledged to stop, and its high percentage of young policyholders. Mr Idris’s brother, Isaac Simon, bought 50 per cent of the company in December 2018. Mr Jones bought the other 50 per cent. Mr Idris and Mr Simon were not previously involved with ACBF. Mr Simon conducted a cultural audit of ACBF while running another company. The rebrand as Youpla includes a new website, featuring the slogan “your mob is our mob” and quotes from Jamal Idris. “I guess I’m lucky as I grew up in a large Aboriginal family so we know what it’s like when someone passes. One thing you don’t want to leave behind is a burden,” Mr Idris said in a promotional video. 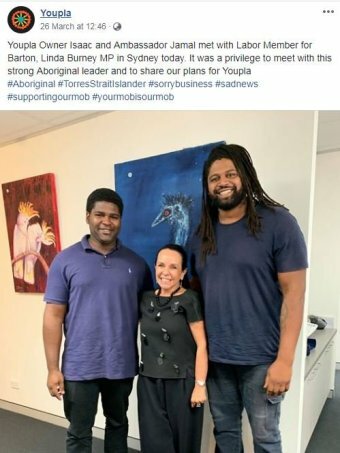 The rebranded company has been on a charm offensive, visiting communities and meeting with Labor MP Linda Burney, who featured in a photo alongside Mr Simon and Mr Idris, which was posted to Youpla’s Facebook and Instagram accounts. “The royal commission exposed many instances of banks and financial institutions ripping off First Nations people. Predatory behaviour like this is completely unacceptable,” Ms Burney said in response to an enquiry by the ABC. Mr Simon said the company is working with regulators to improve its products and six staff were made redundant “pretty much immediately”. “I’m not here to rip anybody off, I’m here to make sure my direct family — my cousins, my aunties, my uncles — and also my wider Aboriginal and Torres Strait Islander family get what they sign up for and also get value out of the product that they sign up for,” he said. Despite the makeover, financial counsellors remain sceptical of the new company and its products. “As consumer advocates we’ve always had concerns in the past and we’ll continue to have concerns in the future,” said Financial Counselling Australia’s Lynda Edwards, who appeared as an expert witness at the royal commission. “By all means, make sure that everybody seeks independent advice, because if this product’s not the best for them, there may be another product that’s better for them or another circumstance that’s better for them as well,” said Mr Simon. ACBF had a history of run-ins with corporate regulator ASIC, including over its use of Aboriginal imagery in its marketing. Since a 1999 Federal Court order, it was required to include a disclaimer in its advertising materials, stating that it is a private company not connected with any Aboriginal or government organisation. Last year, ACBF continued to spruik its funeral products in the aftermath of the commission, holding a stall at the Koori Rugby League Knockout in Dubbo, NSW and handing out toys featuring ACBF branding. The royal commission heard that thousands of customers who had funeral insurance premiums deducted from their welfare payments were unaware that they were no longer covered once ACBF was banned from using the Centrepay system. Tracey Walsh from Mooroopna, Victoria gave evidence that she was not aware that the excess money paid on top of her benefit amount would not be paid out to her family when she died. “I’ve got elders that have been in these funeral funds for years, and they plan to give the money to their families so that they can survive,” Ms Walsh told the commission. “These people have been used and used and used over the generations and it’s just another profit-making off our backs. ACBF chief executive and now Youpla co-owner Bryn Jones was grilled at the commission’s Darwin hearings and admitted he had no qualifications related to the insurance sector. He said his previous work experience included teaching children sport and working in IT. Commissioner Kenneth Hayne was scathing of the company’s conduct in his interim report and said it may have breached the ASIC Act. “I consider that ACBF may have breached its obligations … to not engage in conduct that is misleading or deceptive, or is likely to mislead or deceive,” the report said.